Enter as an individual or as a team! Through Givealittle, teams can compare what other teams have raised … friendly competition for a great cause! 50k a day for the month of May is an amazing way to show support of your local rescue helicopter this Chopper Appeal. Not only will you benefit your community, but your overall wellbeing will thank you too! So what are you waiting for? Get your colleagues or friends together and 50k your way through the month of May. 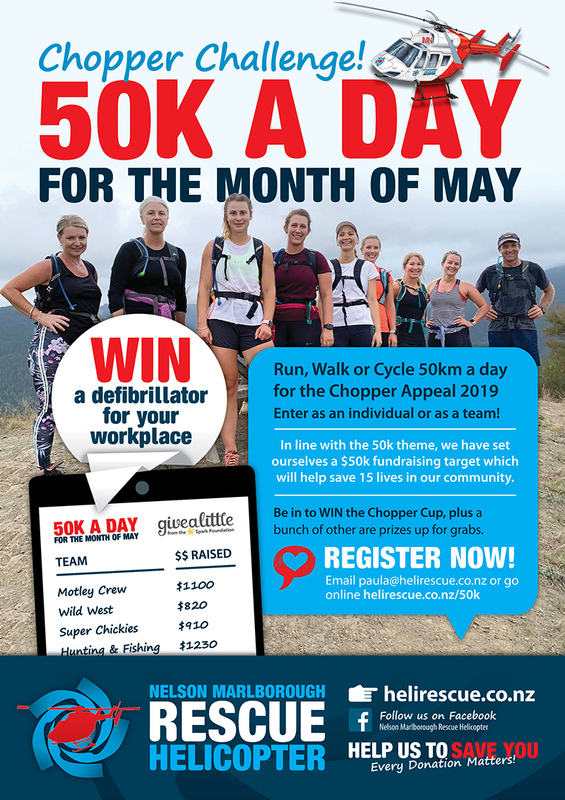 Fundraising is an important part of 2019’s Chopper Challenge. Each team that enters will be competing to win the Chopper Cup. A series of prizes are up for grabs including a defibrillator for the workplace! Through Givealittle, teams can compare what other teams have raised – a bit of friendly competition for a great cause! To enter, please fill out our form and either email to [email protected] or drop into Level 1, 204 Trafalgar Street, Nelson. Phone 03 547 7278 for more information. Along with your form, please email us a photo of you or your team, .pdf corporate logo if applicable and we will set up your Givealittle page so you can start fundraising.